Since we last reviewed global gas price benchmarks in January, factors driving regional price divergence have continued to dominate the global market. Henry Hub spot gas prices plunged to near all time lows around $1.80/MMBtu in April as unconventional gas production continues to spill into the North American market. In contrast, spot Asian LNG prices again breached the $18/MMBtu level in May as Japanese buyers paid up for cargoes to hedge summer demand. The dominant factor driving forward energy pricing over the last six months has been the threat of a global slowdown in economic growth. Increasing evidence of that threat becoming a reality over the last two months has seen a pronounced fall in crude oil prices and the start of a re-convergence in global gas pricing. Every six months we have been reviewing developments in global gas market pricing dynamics. Since we last did this in January, factors driving regional gas price divergence have continued to dominate the global market. Henry Hub spot gas prices plunged to near all time lows around $1.80/MMBtu in April as unconventional gas production continues to spill into the North American market. In contrast, spot Asian LNG prices again breached the $18/MMBtu level in May as Japanese buyers paid up for cargoes to hedge summer demand. The dominant factor driving forward energy pricing over the last six months has been the threat of a global slowdown in economic growth. Increasing evidence of that threat becoming a reality over the last two months has seen a pronounced fall in crude oil prices and the start of a re-convergence in global gas pricing. Brent crude prices sold off sharply in late June towards $90/bbl as Saudi Arabia signalled a continuation of its robust production plan despite increasing evidence of softening demand as the global economy slips back towards recession. The move was exacerbated by stop loss selling from hedge funds, which exchange data suggested were carrying substantial net long positions. The sell-off was much more pronounced in the front of the Brent curve (falling more than $15bbl from late May to late Jun), causing a significant easing in curve backwardation. Long dated Brent prices (for delivery 2019) have remained in a much tighter range, falling $5/bbl since the start of the year but relatively stable during the June selloff. For the moment the long end of the Brent curve looks to be loosely anchored to the $80-90/bbl level consistent with long run marginal cost recovery estimates on unconventional oil production. If spot prices fall below $80/bbl it will be interesting to see to what extent the long end of the curve reacts in sympathy. The move lower in crude prices has a direct impact on the pricing of Asian LNG. Substitution between gas and oil for power generation and heating in Asia, particularly in Japan, means there is a strong relationship between LNG and crude pricing. There is no transparent forward market pricing for Asian LNG, but a forward proxy can be created by conducting regression analysis on the historical relationship between LNG and crude. This forward proxy has fallen sharply with the drop in crude, opening up a disconnect with current spot Asian LNG pricing as shown in Chart 1. 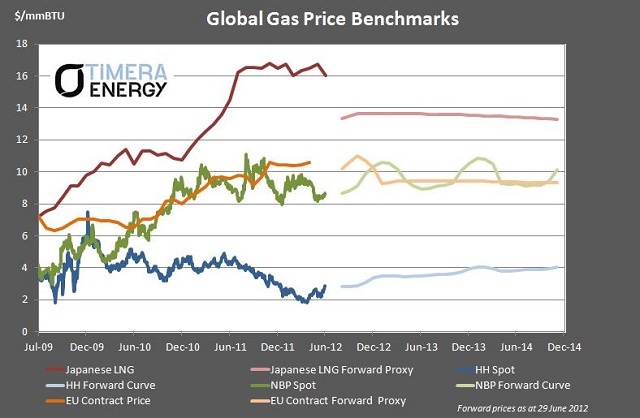 This dislocation between the forward proxy and spot LNG pricing reflects the recent dominance of regional supply and demand issues in driving the spot LNG price. After peaking in May, spot LNG prices have retreated sharply in the last two months to around $16/MMBtu with Asian buyers looking well hedged for a summer that has so far been unseasonably mild. This month’s restart of the first of Japan’s nuclear power plants post Fukushima, has also contributed to the downward pressure on Asian LNG prices. As regional supply & demand conditions exert a stronger influence over Asian LNG spot prices the strength of their relationship with crude has diminished, at least temporarily. This raises important questions as to how the proxy is used to project Asian LNG prices as a function of the crude forward curve. We will explore these issues further in an upcoming blog article. The fall in Asian LNG prices over the last few weeks has reduced the differential between Asian and European LNG prices. But the regional price spread is still well in excess of the transport cost differential meaning that European contracted cargoes will continue to be diverted to Asia for the foreseeable future. The other key differential for the European gas market is between hub and oil indexed contract prices. Over the first half of this year, European gas hub prices (reflected by NBP in Chart 1) have remained relatively robust in the face of falling crude prices. The result has been a further easing in the conditions that have caused European gas suppliers such pain through 2009-10. It is interesting to note that the fall in oil indexed contract prices to date is reflecting oil price weakness from earlier this year, given the six month lag effect in contract price indices. So the sharp selloff in June is yet to flow through into contract prices. A continuation of the fall in oil-indexed prices relative to hub prices may change ‘take or pay’ contract dynamics over the coming months. If contract prices fall below hub prices buyers look to maximise contract lift, increasing the volume of pipeline gas supply. The way in which this relationship plays out is likely to be a dominant feature of European gas market pricing over the coming months. These factors are also likely to have been important drivers behind Gazprom’s decision to settle its contract price disputes with E.ON last week, agreeing a retrospective reduction in contract prices (without diluting oil indexation). The other interesting change over the first half of 2012 has been an easing in NBP forward curve contango. This has been helped by falling crude and Asian LNG prices. But it also reflects the increasing uncertainty around European gas demand as the eurozone crisis continues to escalate.